The look that graces Holly’s face today is one of dynamic determination, that is to say, we can see Holly’s strong moral fiber working to change his personality and this expression is a sign of his change in character. The naive and romantic figure we have simultaneously admired and lambasted throughout the film thus far is beginning to fade into the new Holly we see before us. Through all of his dress-up-detective-work, Holly has actually found some kind of truth, and this truth has to do with the callous and nihilistic nature of the universe in general, and his friend Harry in particular. In a tremendously compelling cinematic moment that blends an enticing mix of Harry’s personal charm and his repentantly self-interested fatalism, we’ve seen Harry fall from grace (literally) as the Riesenrad descends from it’s plinth. Now Holly’s newly-learned realism has erased the romantic glitter from his eyes. In literary terms, Holly’s transformation has taken him from an American adventure/romance like Zane Grey’s Riders of the Purple Sage and thrown him into some naturalist narrative, with no happy endings or sterling heroes in sight. To put it into visual terms, Holly has jumped about a hundred years forward in the painting world. 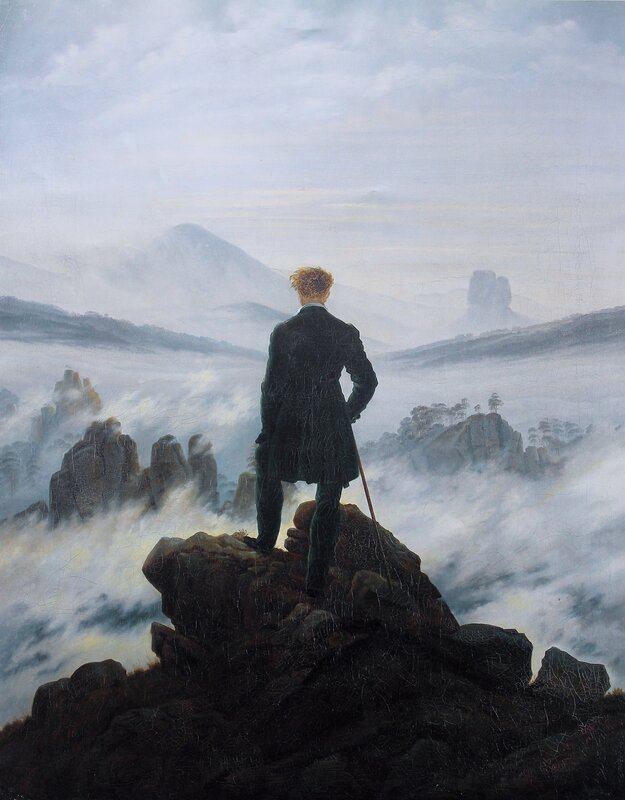 Our old Holly was a man whose cup runneth over with the serene hope of romantic paintings like Caspar David Friedrich’s Wanderer above the Sea of Fog (1818). Of this particular painting, one of the most romantic of romantic paintings, writer John Lewis Gaddes wrote that it was contradictory because it suggests, “at once mastery over a landscape and the insignificance of the individual within it. We see no face, so it’s impossible to know whether the prospect facing the young man is exhilarating, or terrifying, or both.” And our original naive Holly put forward an almost identical perspective, though his own sea of fog was the city of shadows, Vienna. His own attempts at mastery over this massive and unknowable entity showed equally fruitless (remember when his investigations got an angry Viennese mob led by a little boy to chase him?) but were eventually relatively successful, just like this hiker’s climb to the summit. Holly’s outlook, before his fateful encounter with Harry, was definitively romantic, but he has almost instantly changed. Wanderer above the Sea of Fog (1818). Kunsthalle Hamburg. This new Holly, armed with the conviction that the world is an unfair and cruel place has adopted a Realist or perhaps even Naturalistic perspective. The glorious individual that Romantics initially put forward in opposition to the mechanized dehumanization of the industrial revolution (and who was eventually snatched up by the forces of extreme nationalism) has been moved into the realm of myth. Holly’s hardened stare, aimed at major Calloway who sits at his desk going over the Lime file, demonstrates his new world view. Out of the world put forward by Friedrich, Holly has stepped into the ring of a George Bellows painting. He and Harry stand looking eye to eye, and sooner or later one of them must knock the other out while the blood-frenzied crowd around them cheers on the violence they have come to see. Holly’s tightly-set jaw is pondering the decision–whether or not to throw the first punch. 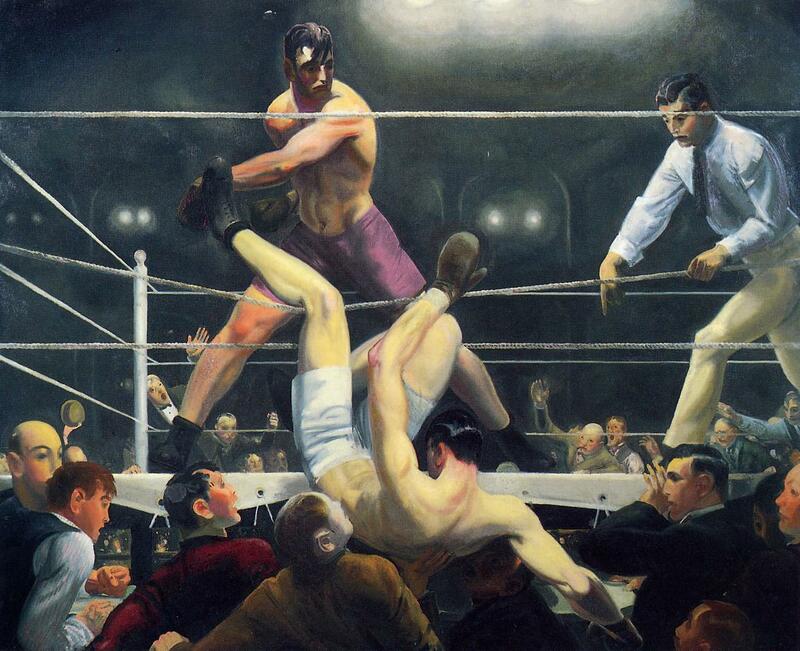 George Bellows’ Dempsey and Firpo (1924). Whitney Museum of Art. And all this is without looking at the dialogue. Holly has just finished telling Calloway that he will not do it; he cannot set up his oldest friend no matter how wicked he might have become: “I know he deserves to hang, you proved your stuff. But twenty years is a long time–don’t ask me to tie the rope.” But just as Calloway admonishingly accepts Holly’s refusal to help (“Okay, forget it.”) in stumbles Brodsky, a Russian policeman who has come to report on the progress on their case against Anna. And in close-up, we see Holly’s jaw begin to tighten to the nut-cracking grip we see above. Our still finds a despondent Calloway still waxing poetic about the glory of Britain in World War II. 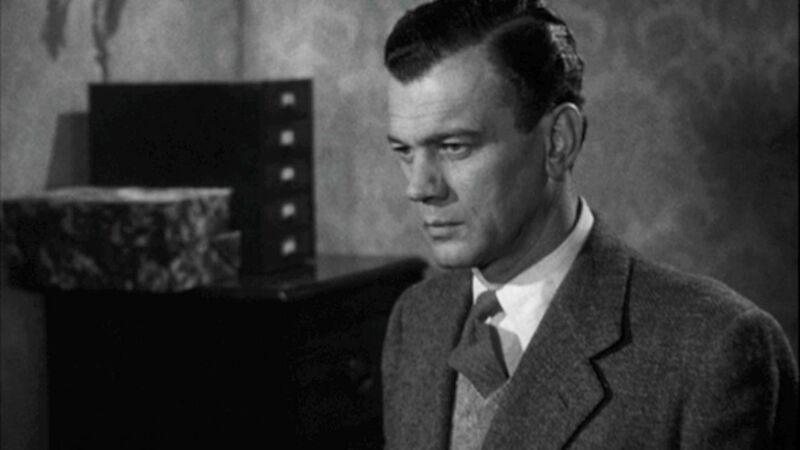 As Holly slowly ponders the momentous decision of whether or not to turn Judas on his oldest friend, Calloway pulls open the Harry Lime file on his desk and we are privy to a terrific visualization of the two sides of Harry, the two sides Holly is mulling in his head. “In the last war, a General would hang his opponent’s picture on the wall,” Calloway says flipping through this file, “He got to know him that way. I’m beginning to know Lime. I think this would have worked with your help.” Looking down at these almost Jekyll and Hyde images of Harry, we can only imagine what Calloway might see, but Holly’s impression may be easier to understand. On the left we have a heartless racketeer, a man only interested in making his dirty money (“free of income tax, old man”) and unconcerned by the well-being of the “poor devils” who might be hurt, and even more importantly, unconcerned with Anna’s fate. On the right, grinning with hair playfully tousled, we see the roguish boyhood friend, a man with such charisma and charm that even his threats come out with a life-affirming smile. As Holly ponders these two sides of his friend, whether he should stay loyal to the Harry he knew or help stop the racketeer he knows is killing innocents, this striking visual metaphor comes into view. 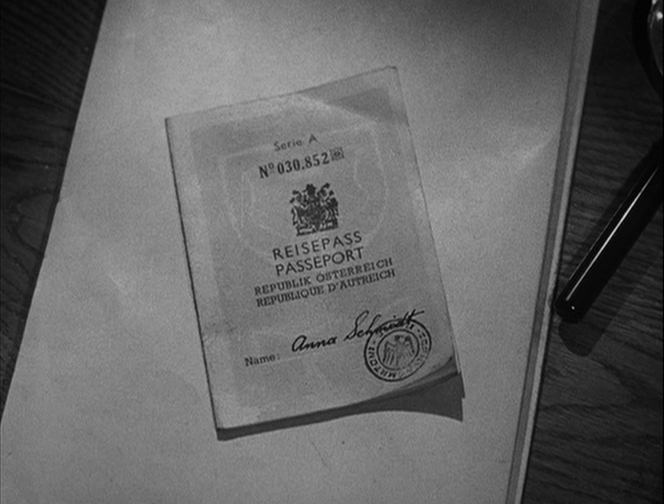 Mid-decision, the Holly-eye-view camera pans to another object of interest, Anna’s papers. 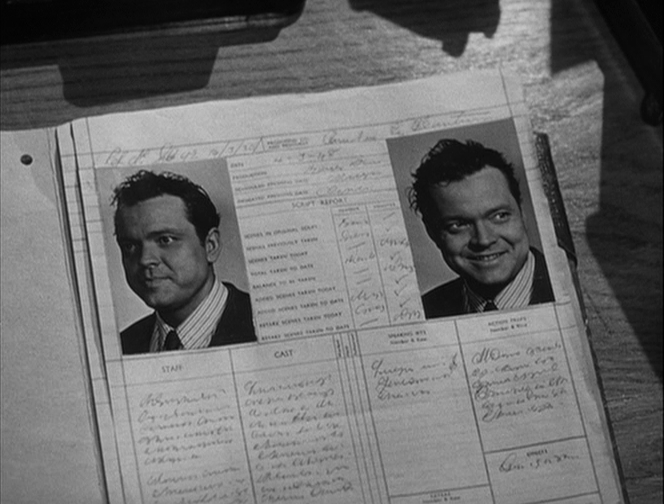 So, leaving the image of Anna Schmidt’s signature in our collective eyes, the camera cuts back to Holly, even with his now-hardened persona, Holly is still susceptible to the pangs of love, requited or not. And with this straw breaking his camel’s back, we know what Holly means when he responds to Calloway. “What price would you pay?” Holly, twisting and turning in this cruel world, will trade Harry’s freedom for Anna’s, and since he is a realist now, no longer buoyed by his romantic notions, he knows that however things go, he cannot find a happy ending. Like the great naturalist writer, John Steinbeck, Holly’s decision is reminiscent of the end of Of Mice and Men. Holly sees himself as George Milton, with Harry cast as the hapless Lennie Small. Harry, who has undoubtedly committed murder, is in a similar position to Lennie, crouching in the bushes in hiding while the authorities hunt him for the crime he has committed. And Holly, his oldest friend, needs to catch him first before one of the more savage hunters does, both to protect him from the horrible abuse of a more vicious hunter, and because of Candy’s lamented advice. “I ought to have shot that dog myself, George. I shouldn’t ought to have let no stranger shoot my dog.” In catching Harry, Holly will be, in a sense, shooting his own dog, and putting him out of his misery.